Update: HWJapan announced its closure as of March 15, 2011. Sad really because I liked their service. Update 12/04/2009: Package shots of my second shipment from HWJapan can be found here here. Update 11/26/2009: My order arrived today from HWJapan, pictures of the box and review of the packaging can be found here. Just posted an order at HWJapan a few days ago and am now waiting for my order to arrive. Great timing too on my part as most of the Gundam model kits were on a 10~30% discounted price scheme. Unlike most online sellers in Japan that cater to international customers, HWJapan is actually a subsidiary of an actual model kit company, and this is Aoshima. Aoshima has been building model kits since 1961. They are located in Shizuoka Prefecture, the mecca of model kit manufacturers. HWJapan claims that their prices are 6~25% lower than retail prices in Japan and given their location I'm actually not surprised. Having Tamiya, Bandai, Hasegawa etc as your neighbors means that you can get a great price because logistics isn't much of a factor in the final selling price of the product. HWJapan carries not only Aoshima products but others as well. I noticed however that its only recently that they started stocking up on toys. Take Yamato 1/60 scale toys for an example. Right now they only have the recent releases and none of the old ones. Mostly what you see that they have a lot of are model kits and modelling tools and materials. Though they have also been affected by the recent ruling that made shipping of modelling paints and solvents overseas more strict, hence their announcement that they will no longer sell these to overseas customers. In terms of services, HWJapan offers EMS and SAL shipping for you to choose from. Payment method is by credit card or paypal. As listed in their site faq, they will never declare an item as a "gift" in customs in order to avoid duties and that they will declare the actual value of your purchase on the field. HWJapan also offers a point system in place to reward users and which can be used to reduce the cost of future purchases. 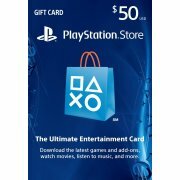 The reward system however will not work for bulk purchases. Bulk purchases with even bigger discounts can be availed of from them if your order is 100,000 yen or greater. To place an order you have to first register in their site. What follows next is standard fare, add the item to your cart then press checkout to process the shipment and to choose the type of shipment that you want. At the checkout part of the site, they can already show you the total cost of the product with the shipping. 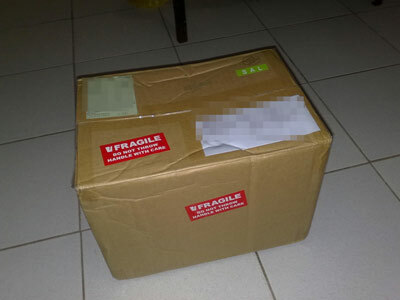 This is unlike the other online shops which will comeback to you with the cost of shipping of your package. HWJapan won't ask for payment right away, but rather would check first if the item is still available. During the confirmation step of the order however, it is noted there that the total price of the item with the shipping might still change, so the final invoice for payment might still vary with the one listed. Based on my experience however there was no difference with the price listed in the checked out item versus the payment invoice sent to me. After they had made sure that your order is available, they will send you an email which includes your order no. You have to enter this along with your email address in another portion of the site in order to be able to pay for your order. I waited for a day, before I received their payment request. I like that the site has SSL enabled in the registration and check out processes. As an added security feature, the site doesn't print out directly your address and other personal information about you when viewing in an unsecured page. One major plus for them is that they have a lot of inventory on their site, so you can save a bundle on shipping costs by buying from just one store. I also like the way that they organize their site. The sidebar is very convenient because you can jump immediately to the product category that you like. At the category level you can go directly to the series and product type. Take Gundams for example, you can jump right directly to the series (Gundam 00, Gundam Seed, etc) and the scale or product type that you want. One other feature I like is that you can sort the product pages by either latest date, highest price or lowest price via a drop down box on the upper right part of the page results. Aside from that, you can also filter the results out by new items, pre-order items, closed items and re-release by clicking the links right beside the drop down box sort box. The default of course it that they display all the results. Another thing is that the search function doesn't produce accurate returns on your search keywords. You can circumvent this by using google and appending " site:hwjapan.com" to your search query. This limits the search to hwjapan's site. It says in their site that it might take 2-4 days for an order to be shipped. True enough it took 4 days for them to send out my order after I had paid. It also took one day for them to send me a payment request after I checked out my order. As mentioned above that some pages of the site are buggy. The design of the site looks like it was hastily built, you can see that there are a lot of "untitled" portions of the site as well as product pages without any descriptions. The Japanese version of the site however looks great and always updated. For more information check out their FAQ and policy pages. After a month of waiting the box finally arrived. Took quite a long time due to my geographic location and because I opted for SAL shipping. My order arrived via a nondescript box, which is the way I like my packages to arrive so that nobody will be tempted to steal it. I've heard of horror stories wherein the postal people steal your packages. Luckily I haven't experienced that before and I'm hoping I'll never do. I heard a few months ago that the post master general in my country was cracking down on erring postal workers and already fired a bunch. Well anyhoo, back to the package. The box had fragile stickers plastered all over it. When I inspected the box however I noticed that there was a dent in it that made a 2 inch L-shaped rip in the box. The rip however was not enough to expose the contents inside. When I inspected the plates inside the box, one of the plastic bags with the gates inside them was cleanly ripped open by its seams, while in another plastic bag one part was removed from its gates. Most likely during the shipping process this occured. I'm wondering now if those red fragile stickers are like an open invitation to package handlers to treat it more roughly? Like what a red cape does to a bull. Oh well, no fault of HWJapan there but I do like the fact that they provide this extra service of providing fragile stickers on your package. 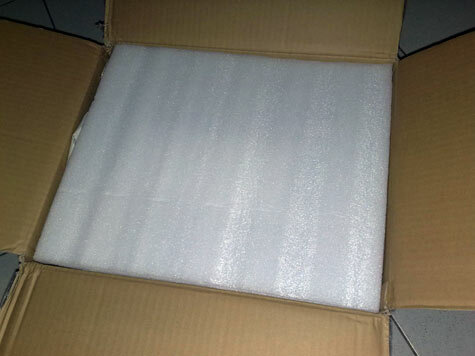 Upon opening the box you can see that HWJapan placed a 3/4 inch thick foam padding on top of the items. 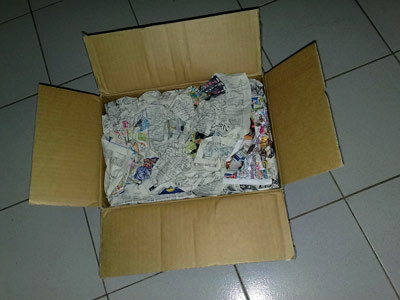 Then instead of bubble packs they placed crumpled up newspapers to pad the items inside. Removing the generous amount of old newspapers reveals the 1/60 Gundam Exia from Bandai that I ordered. 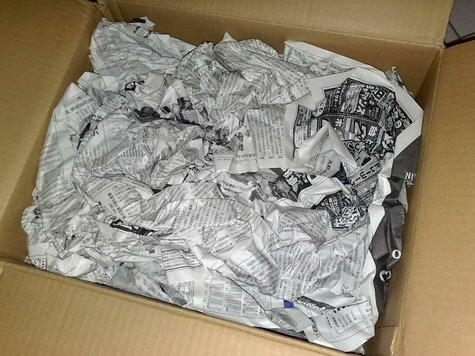 Although on first glance I would like to give HWJapan an A+ for packaging, the bottom part of the item however only had a sheet of old newspaper separating it from the bottom of the box... tsk tsk tsk. 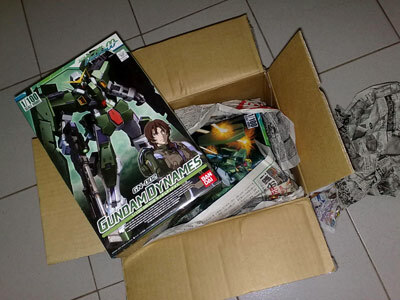 Despite that minor inconvenience, HWJapan is still a great seller and is now officially my most favorite online store to buy Gundam kits from. More sample shots of shipping boxes by HWJapan. 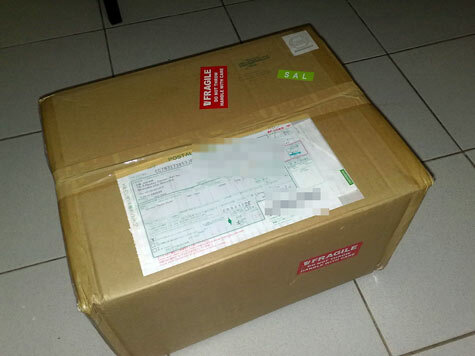 This time my order of a 1/100 Gundam Dynames and 1/100 Gundam Cherudim arrived in this type of box. Once again newspapers were used to cushion the package inside. 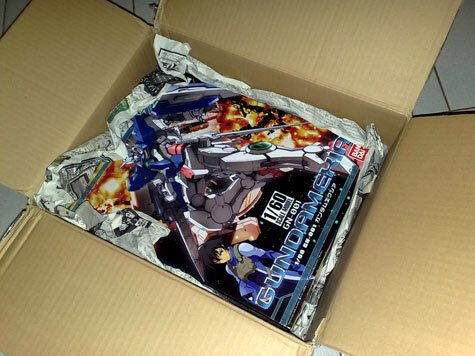 Then here's the shot of the box with the Gundam Dynames already out.